Were Martin Luther’s ideas the beginning of a larger movement for international human rights in the 20th century? Nicholas P. Miller, PhD, is professor of church history at the Seventh-day Adventist Theological Seminary, Andrews University, in Berrien Springs, Michigan. Dr. Miller has degrees in theology (BA), law (JD), and church history (PhD), and has taught courses on church history, religious liberty, and Adventist theology for about ten years. Prior to that, he was a lawyer in private practice, specializing in church-and-state cases. 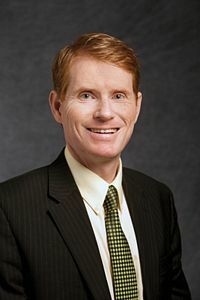 He appeared before the United States Supreme Court in the religious school funding case of Mitchell v. Helms, helped draft and pass the federal Religious Land Use and Institutionalized Persons Act of 2000, and was the executive director of the Washington, D.C.-based Council on Religious Freedom. His book on the religious influences on American religious freedom, The Religious Roots of the First Amendment, was published by Oxford University Press in 2012. Dr. Miller enjoys scuba diving, mountain climbing, and playing basketball and soccer with his students and children, Patrick, Kelli, and Nicole. He is married to Leanne, a singer, violinist, and practicing pediatrician.